A voluntary yielding of the will, judgment, or inclination to what is proposed or desired by another. A rational and voluntary concurrence of the parties is necessary in all cases involving a legal act or contract. This principle gives rise to several distinctions in civil law. If a man has been forced to make a gift to another, his act is considered invalid, even though he made no formal protest (B. B. 40b; Ḥoshen Mishpaṭ, 242, 1). If he has been compelled, however, to sell either personal or real estate, the contract is valid, for it is presumed that, unless he had previously made a formal protest ("moda'a") before two witnesses, he was reconciled on the receipt of the money (B. B. ib. ; Maimonides, "Yad," Mekirah, x. 1, 6; Ḥoshen Mishpaṭ, 205, 1). Minors above six years of age, who show intelligence and an understanding of business, are presumed to be capable of consenting to the purchase, sale, or gift of personal property, but not of real estate (Giṭ. 59a; Mekirah, xxix. 1; Ḥoshen Mishpaṭ, 235, 1). If a guardian ("apiṭropos") is appointed for them, they can negotiate no business without his consent (ib. 235, 2; see "Pitḥe Teshubah," quoting the opinion that even then his gifts should be valid). The deaf-mute can enter by signs into contracts concerning personal estate. He must, however, be examined to see that he understands what he is doing (Giṭ. l.c. ; Mekirah, xxix. 2; ḥoshen Mishpaṭ, 235, 17). The mute can sell and buy and give away either personal property or real estate (ib. 235, 18). The idiot can make no contract, and the court appoints a guardian for him as for a minor (Ket. 48a; Mekirah, xxix. 4, 20; Ḥoshen Mishpaṭ, 235, 20). The consent need not always be expressed. Silence is regarded as voluntary consent (Yeb. 87b; B. M. 37b). Therefore, in marriage contracts, if a man gave a coin to a woman and pronounced the prescribed formula in the presence of two witnesses, and she did not protest immediately, the marriage is valid (Eben ha-'Ezer, 42, 1; see Isserles' gloss). By "immediately" a space of time is meant which would be sufficient for a disciple to greet his master thus: "Peace be with thee, my master and teacher" (B. Ḳ. 73b). If, however, she was under duress, the marriage is invalid (Yeb. 19b; see Rashi's commentary, where the principle of consent on the part of the woman is derived from Deut. xxiv. 2: "She may go and be another man's wife"; Ḳid. 2b; Eben ha-'Ezer, l.c.). Authorities differ, however, regarding cases in which the man is under duress in contracting a marriage; some are of opinion that inasmuch as he can divorce her at will afterward, the marriage should be valid (Eben ha-'Ezer, l.c.). 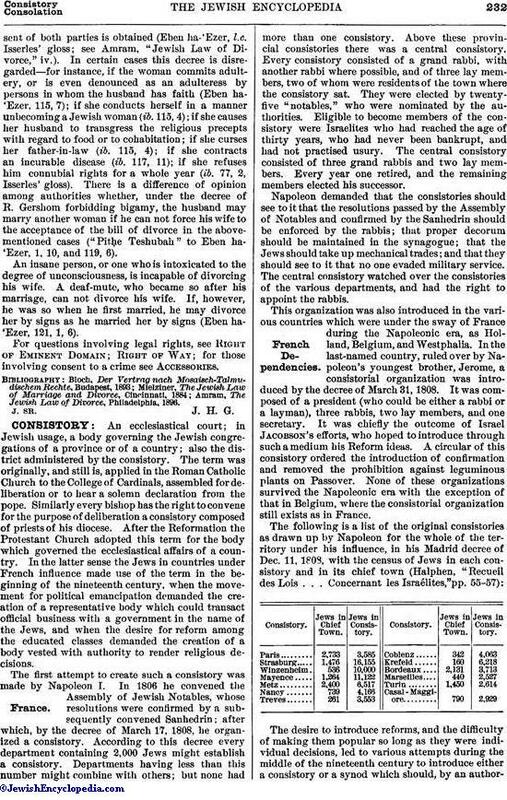 Since, however, compulsory divorce is now impossible, according to the decree of R. Gershom, the man would be in the same position as the woman, and a forced marriage, whether the man or the woman be the party under duress, would be considered invalid (Mielziner, "Jewish Law of Marriage and Divorce," § 29). Consent being necessary, insane persons or idiots were considered incapable of entering into a marriage contract (Eben ha-'Ezer, 42, 2). If a person who is only weak-minded or temporarily insane has contracted a marriage, it is doubtful whether such a contract could be declared invalid, so that the woman may be allowed to marry again (ib. Isserles' gloss). A marriage contracted by an intoxicated person is valid, unless he was at the time of his marriage entirely unconscious, "as the intoxication of Lot" (ib. 42, 3). Deaf and dumb persons, being looked upon as idiots, could not contract a marriage according to Biblical law, but the Rabbis sanctioned such a marriage when performed by signs. This being merely a rabbinical institution, it is not as valid as other marriages, and a very serious question would arise were another man to contract a marriage with the woman after she had been married to the deaf-mute (Yeb. 112b; "Yad," Ishut, iv. 9; Eben ha-'Ezer, 44, 1; see Mielziner, l.c. §§ 33, 34). Minors are usually classed with deaf-mutes and idiots by the Talmudists, and their marriage is also considered invalid by lack of consent (Eben ha-'Ezer, 43, 1). While mutual consent is absolutely necessary in marriage, it is, according to the old Jewish law, not necessary in divorce, and the husband can divorce his wife even without asking her consent (ib. 119, 6; from Mishnah Yeb. xiv. 1). As in the course of time the act of divorce came under the control of the rabbinical courts, the Rabbis had an opportunity to restrict this law gradually by many regulations, until, in the eleventh century, by a decree of R. Gershom, this arbitrary right of the husband was entirely abrogated. Although Maimonides made no mention of it in his code, this bold regulation was soon adopted by the great majority of the Jews, and a divorce without sufficient cause will not be granted unless the consentof both parties is obtained (Eben ha-'Ezer, l.c. Isserles' gloss; see Amram, "Jewish Law of Divorce," iv.). In certain cases this decree is disregarded—for instance, if the woman commits adultery, or is even denounced as an adulteress by persons in whom the husband has faith (Eben ha'Ezer, 115, 7); if she conducts herself in a manner unbecoming a Jewish woman (ib. 115, 4); if she causes her husband to transgress the religious precepts with regard to food or to cohabitation; if she curses her father-in-law (ib. 115, 4); if she contracts an incurable disease (ib. 117, 11); if she refuses him connubial rights for a whole year (ib. 77, 2, Isserles' gloss). There is a difference of opinion among authorities whether, under the decree of R. Gershom forbidding bigamy, the husband may marry another woman if he can not force his wife to the acceptance of the bill of divorce in the above-mentioned cases ("Pitḥe Teshubah" to Eben ha-'Ezer, 1, 10, and 119, 6). An insane person, or one who is intoxicated to the degree of unconsciousness, is incapable of divorcing his wife. A deaf-mute, who became so after his marriage, can not divorce his wife. If, however, he was so when he first married, he may divorce her by signs as he married her by signs (Eben ha'Ezer, 121, 1, 6). For questions involving legal rights, see Right of Eminent Domain; Right of Way; for those involving consent to a crime see Accessories. 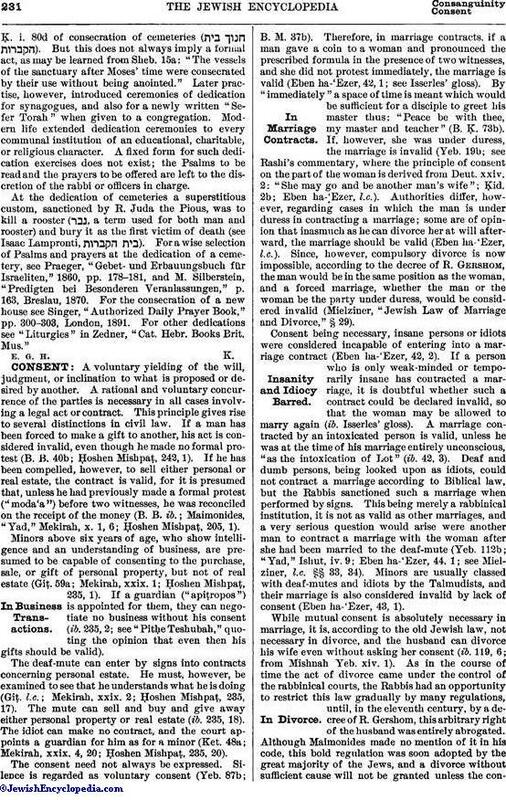 Amram, The Jewish Law of Divorce, Philadelphia, 1896.